Towards the end of the 1920's American aviation enthusiast Walter Beech created his own aircraft engineering company, the Beech Aircraft Corporation. 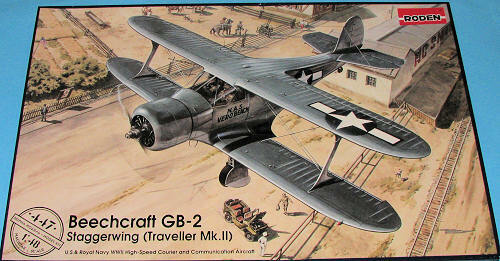 One of the most successful projects of the newly formed company was the Model 17 aircraft, named the Staggerwing after its unconventional biplane configuration, whereby the upper wing was positioned to the rear of the lower wing. In the middle of the Thirties appeared the D17 modification, which became popular among pilots. Before the USA entered into WWII, the Staggerwing had various occasions to join the fighting in the sky; in Spain, and in the confrontation between China with Japan. 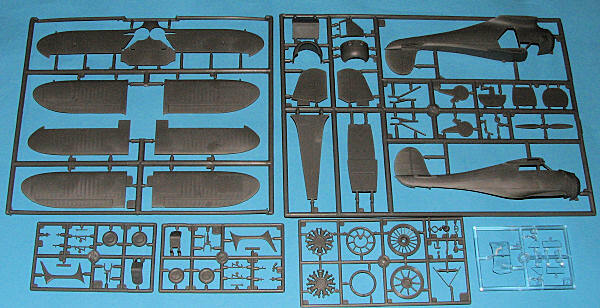 This is not the first kit of this aircraft in 1/48 scale as AMT released one back in the late 1960s along with their MiG-15, Meteor, DH-4 and P-36, all of which have now been superseded by much more accurate and better detailed kits. Picking this one adds to Roden's somewhat eclectic line of kits. They seem to pick subjects that are both interesting and able to be done in several boxings, this one being the second one so done. The molding on the kit is well up to Roden's standards with very nicely done engraved detailing and equally well done fabric representation. It just looks right. I did find a bit of flash, a few sink areas (underwing near the wheel openings), and some ejector pin marks that will need to be taken care of (inside gear doors and cabin doors). I also noted some slight mold shift on one of the large sprues. The interior is very nicely done with some quite petite parts going into the building of the seat frames. There are control yokes, rudder pedals and an instrument panel to go along with the three seats. 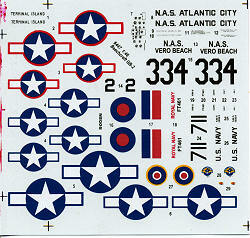 A decal is used for the instrument faces. The engine is also nicely detailed with two engine halves, intake and exhaust manifolds as well as a push-rod assembly and some smaller bits. This is trapped between two cowling halves. Main gear is also nicely molded. One has to fold the lower part of the gear door and the wheels themselves are in halves. The wings both have the ailerons/flaps molded into one wing half to give a nice, sharp trailing edge, something I appreciate. There are also 'cups' into which the flying wires can be inserted, making what little rigging there is, an easy chore even for those of us who are intimidated by rigging. Clear parts are a bit cloudy when compared to some, but a dip in clear gloss acrylic should help. Instructions are quite well done with lots of well drawn detail to help in construction. Pa int references are Model Master. There are five markings options. Four of them are USN types with one from Vero Beach, Florida, one from NAS Atlantic City, one with VRF-3 at Terminal Island and one of an unidentified unit (this is the one with the red surround insignia). Three of them are in the Tricolor scheme with variations on the demarcation lines while the fourth has no white on the underside, that being in intermediate blue as is the side. The fifth is a British Traveller Mk II as assigned to the RAAEE and it is in British colors. The large decal sheet is mostly well printed, though the red surround US insignia and the British fuselage roundel are off register. Thanks to Roden's rather poor decal reputation, it may be best advised to replace the insignia with aftermarket ones. I'm sure that many are quite pleased that this one has been released and I'm equally sure that many civil boxings are in the offing. Thanks to the minimal rigging, this is one I can handle and I'm already underway on the build so stay tuned. My thanks to Squadron Products for the review kit. Get yours today at your local retailer or ask them to order it in for you.